This cabin was amazing and the view was beautiful. I do a once a year couples retreat and this cabin had everything on our wish list and more. All the rooms were great and very private. We really didn't have any issues with the cabin but ladybugs problems. I notified the front office and they handle it within a timely manner. We were very pleased with everything. The check in and checkout process was easy. We will definitely be back. This was my our second time renting through Cabin USA and I highly recommend them. The property was good however the pictures listed on the website are a little deceiving as the general condition of the cabin did not meet expectations of the actual layout of the property. A couple of things need attention: several sinks were slow to drain, bedroom on back right side upstairs - bathtub in this bath would not drain until I pulled hair from drain, towel hanger in same bathroom above the toilet falls off the wall, we were only give 1 garbage bag for the downstairs kitchen area - need more that this. I personally own vacation rental properties in the Gulf Coast and the little things often get overlooked. Overall the property was satisfactory. We had a great time. There is not enough seating in the den or at the table for eleven adults. The pool needs a rail to be able to get in and out. But we did have a good time. Hmmm where do i start. It was my family first time to pigeon forge. And i tell you this was one of our best trips. The cabin was very clean. Clerks at check in was very polite and quick. Theeee best views ever. Enjoyed ourselves in the pool and game room. Lots of room as there we're 13 of us.. im thinking about booking again for my birthday in Dec. Close to shopping/entertainment.. The cabin was very clean. There was ample parking. The loft area with the pool table, video games, etc was very nice. We liked that there were extra blankets in the rooms, several towels and washcloths and that they were king size beds. The beds, however, were not comfortable. In addition to the mattresses being uncomfortable they made a lot of noise so anytime someone rolled over you'd wake the other person up. Also, the top sheet was really too small for the bed. For a cabin that sleeps up to 18, there is not enough seating if your goal is to have a lot of time together. The kitchen table would seat 8-9 and the living room seated 5 so everyone couldn't eat together. Also, trying to cook for 15 people in a kitchen with very little counter space was a challenge. The refrigerator is a very good size refrigerator, but we also brought coolers to keep our drinks in. The swimming pool inside the house is really only useful if you have small children. It's about the size of a kiddie pool but deeper. We had teenagers and adults so the pool was wasted area for us...I would have rather had more living room or kitchen space :-) The only other thing that was a surprise for us was that there was not a bathroom outside of a bedroom. So, those sleeping in the loft area had to go into someone's bedroom to use the bathroom which we found to be inconvenient. For those of us IN the bedrooms, we liked having a bathroom to ourselves! As far as the check-in process, we did the express check-in which was great because we could go straight to the cabin and those who arrived before we did could go on to the cabin. I did not feel entirely comfortable taking a picture of my credit card front and back though. No other online site has ever required that and I am surprised that they do. I just hope I do not regret it. We had a family vacation at the Preserve, it was absolutely the best vacation ever. The little ones enjoyed the pool and the older ones enjoyed the game room. It was the perfect cabin for our family. Thank you. We called and requested more forks because we only had 7 and no one showed. No call or anything. The refrigerator barely worked. It wouldn't stay cold. Our group enjoyed The Preserve. The only issue we really noticed was the cabin's cleanliness on arrival. There was an unopened beer and a shot glass in the pool. There were undergarments left in one of the rooms. Not exactly what you're expecting on a church trip for kids! Floors weren't super clean. Some wood needs to be refinished. Overall, we were happy and would stay there again. Our family LOVED this cabin, from the game loft to the pool to the outside grills and fireplace. There was so much for the 9 children in our family to play and do. CabinsUSA staff was very friendly and helpful with all our questions, concerns. We called twice for trash pickup and it was done within 2 hours. The Kitchen was small, but the cupboards were full of the necessary tableware/cookware. We liked how the cabin was set apart making it more private and we loved the wide driveway with plenty of room to park vehicles. Our only complaint was the cleanliness of the cabin. It needed a deep clean in every room. Thick dust was on the bedroom furniture, lamps, walls and under beds/furniture. Splatter behind the sinks. The cabin looked like it had sat all winter and just needed a spring cleaning. The remotes in the Theater also needed batteries. (Maybe directions on how to run the direct TV placed in the bedrooms). Light bulbs needed replaced in the kitchen. Overall, we were very pleased and would definitely book this cabin again if we planned another family vacation. Beautiful cabin and perfect for a couple weekend! I booked cabin for 6 couples and everything was perfect. One thing everyone loved was that we all had our personal bathrooms and no one had to share. Rooms, living room area and kitchen look exactly like the pictures. We also utilized the pool and played games in the theater room. We will definitely book again for our next getaway. Enjoyed our stay. Thank you! Our only complaint was a broken chair at the kitchen table, a picture at the bottom of the stairs in the livinh room that has bee taped back together and no counter space. Other than that the cabin was perfect, my crew and I really enjoyed ourselves. The view was awesome also. The preserve was great! we had a ball with all the things to do in the cabin it was hard to leave and do the things we had planned. There was no cabinet space for our food due to the large amount of dishes spread out in the majority of the cabinets. I'd suggest purchasing a larger frying pan and pitcher. Also a vacuum cleaner would've been nice and a table underneath the tv in the theater room. The microwave front panel/door should also be replaced before it falls onto the hot stove and injure someone. Chairs in the pool area would also be nice. There were only 2 pillows on each bed and the rest of the pillows (3) were on the shelf in the closets. The couch in the living room should be replaced before a small child falls into it or damages an adult's back. The staff was very pleasant and anytime I called they immediately came in. They were "AWESOME!" "KUDOS" to your great staff. All 6 couples had a wonderful time and we are planning to visit again this summer and Super Bowl weekend 2019. We would like another 6 king bedroom with 6 bathrooms and a pool that has chairs and possibly tables. Do you have any cabins like this? First I want to say I enjoyed this cabin and would stay in this cabin again. Things that could be improved are cleanliness, had lady bugs everywhere in the cabin. Washer and dryer need replaced, they were literally useless. Microwave has seen it's better days. Things I wish this cabin had are a central bathroom, all 6 bathrooms are in a bedroom and a bigger family room for 18 people. Loved the location, scenery, game room, pool, and movie room. I did have an issue with getting our garbage picked up even after I called. Overall, I liked the cabin. All the immediate family(14) really enjoyed visiting and staying in the Preserve . The kids loved the pool and big screen movie room.All the bathrooms was a plus.For a large group this is a great place to stay. We had a wonderful time. The house was very nice and it was big enough for our 14 people. Everyone had a great time and we would recommend this house to anyone. It started snowing when we were leaving. Wonderful time!!! Thank you for all of your kind words! We here at Cabins USA strive to give each of our guests the best stay possible while vacationing in the Smokies. Thank you for choosing Cabins USA and we look forward to seeing you again soon! There was a lot of bugs in the cabin ants and small bugs. Outside of that great cabin. Need an exterminator!!! Thank you for taking the time to let us know about your recent stay in The Preserve! We here at Cabins USA strive to ensure each of our guests have the best stay possible while vacationing in the Smokies. When you are ready to stay with us again, please mention you are a return guest for an additional discount. Thank you for choosing Cabins USA and we look forward to having you are a return guest again! Perfect cabin for a weekend getaway with extended family. With so much to do in the cabin no one wanted to go out. The location is perfect for going to Pigeon Forge and Gatlinburg. We are already making plans for next year at the same cabin. Absolutely amazing!! From the staff to the cabins to the over all experience it was just wonderful! This was my families first time visiting Pigeon Forge and thanks to Cabins USA we are already planning our trip for next year. The cabin was EXACTLY as shown in the pictures. The staff was beyond helpful and friendly. I gave everything a 10 except cleanliness I gave an 8. My ONLY reason for that was because I wasn't aware that they don't come and clean the hot tub through out the week and add chlorine to the pool through out the week. That would be my only recommendation for improvement. Other than that......just a perfect vacation! Thank you so much Cabins USA!! Thank you for taking the time to let us know about your recent stay in The Preserve! We here at Cabins USA work hard to make sure each of our guests have the best stay possible while vacationing in the Smokies. Our cleaners dump and clean our hot tubs between each guest. When you are ready to stay with us again, please mention you are a return guest for an additional discount. Thank you again for your review and thank you for choosing Cabins USA! i really enjoyed our stay. the cabin is awesome. would have been better if the Tvs and cable worked to have more entertainment. the maintence said that there was nothing they could do about the TVs and cable not working. Oh My God (OMG)! The family loved the cabin. The pictures does no justice. Everyone was so shocked about the cabin and all it had to offer. Everything we needed was there. We will surely return and The Preserve will be the cabin for us. It was very spacious. The only issue we had was it was cold and the thermostat was set to only go to 75. Rooms on the second floor were very cold at night. I am so happy to hear that you enjoyed your stay in The Preserve! We here at Cabins USA work hard to ensure each of our guests have the best stay possible while vacationing in the Smokies. When you are ready to stay with us again, please mention you are a return guest for an additional discount. Thank you again for your review and thank you for choosing Cabins USA! On the first day we were unable to get the pool room door to lock. Maintenance adjusted the lock on day 2 however it still didn't want to lock. The can opener in the kitchen does not work. The bedroom door on the second floor above the living room will not close. The kitchen window was held shut with a stick. Other than these issues we had no complaints! Great cabin. We have stayed in many cabins with many different companies in the Pigeon Forge area over the last 20+ years. 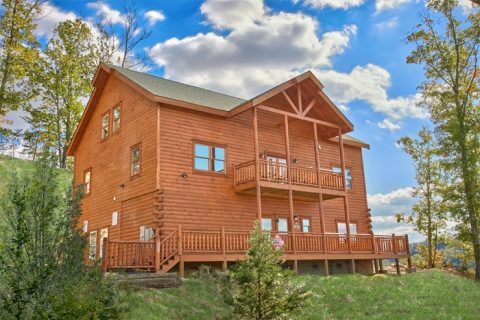 I can say, by far, we have found our dream cabin (The Preserve) and company (Cabins USA)!!!! Phenomenal from the beginning to the end. The cabin itself is in a great location and has all the amenities that you could hope for. The bedrooms are huge!!! The kitchen has anything you need and plenty of it. Cabins USA is wonderful to work with and have an easy, non-stressful check-in and check-out process. We will definitely book this cabin again!! LOVED it!!!!!!! My friends and I have been coming to Gatlinburg every year for the past 5 years and have always used Cabins USA. Cabins USA has always offered us a great time with their amazing cabins, and also with the great staff. The Preserve was a great cabin as far as all of the amenities, and cleaneness. The only problem we had were a few broken things like the kitchen table chairs, one of the bedroom doors, and a couple of other little things.. Besides these little broken things, it was a fun time and we will definitely stay at the Preserve again..Also the staff are great they are very prompt with getting back with us when needed. Excellent place for the whole family to vacation!! Love it!! Have already booked for next year!! The Preserve is a beautiful cabin with great amenities. We love all the game on the 3rd floor, the pool was relaxing. The movie room made quite an expression on the kids. The bed are all comfortable. The 2 issue we had were fixed within hours. Eric was the best and very helpful.. Our only complain is there is no pantry to put groceries and with a large group that was really a problem. If planing to cook the kitchen is small and making it hard to prepare food for a large group...we will consider the Preserve for our next visit to the Smokies... Thank you to everyone at Cabin USA for great service. I am so happy to hear that you enjoyed your stay in The Preserve! When you are ready to stay with us again, please mention you are a return guest for an additional discount. Thank you again for your review and thank you for choosing Cabins USA! Our family of 15 (including boys aged 17 to 2) enjoyed the cabin very much. Something good for everyone. The video room was especially handy for us. The fact that the games tables were on the third level helped our flow of activity. The pool was very convenient. The cabin was clean and there were plenty of supplies except there were no coffee filters. We were told there wasn't a grill. However there were two charcoal grills. This was a special vacation for us. Wish we could afford it again. Love ,love ,loved our cabin!!! We had a blast!! Now I know where to book our cabin rentals!! We are very satisfied customers!!! See you all next time!! We truly enjoyed having our own private pool and theater room!! Thank you for all of your kind words! We here at Cabins USA work hard to make sure each of our guests have the same great stay you enjoyed while vacationing in the Smokies. When you are ready to stay with us again, please mention you are a return guest for an additional discount. Thank you for choosing Cabins USA and we look forward to having you as our guests again! our stay was truly wonderful, beautiful views, convenient location, large rooms, and mountains of fun. the only thing that didn't work right was the Wi-Fi , the Wi-Fi really really sucked,making it hard to stream movies, but we us redbox and yet again everyone was happy.you just can't put a price on the amount of fun we had thanks CABINS USA. This cabin was all we needed and wanted it to be. It was so spacious, affordable, comfortable, and all the amenities were wonderful. We stayed the weekend of May 13-15 with 8 adults and 7 children. There was really so much to do at the cabin that we didn't even have time to enjoy it all! The indoor pool was amazing, the children had a blast in there! The theater room was a fabulous addition to the cabin. The pool table, arcade game, air hockey, foosball table and the hot tub was great! When we arrived, my husband and I checked out all the rooms and discovered that one of the drawers in the kitchen was broken. We made a quick call to the cabin services and they sent someone out the next day to fix it. We also discovered that there was a leak in the hot tub, and they were quick to repair that as well. It was so wonderful having a private bathroom in each of the six bedrooms. We will definitely use Cabins USA the next time we visit the Smoky Mountains. Thank you for providing our families with a wonderful experience. I am so happy to hear that you enjoyed your stay in The Preserve! We here at Cabins USA work hard to make sure each of our guests have the best stay possible while vacationing in the Smokies. When you are ready to stay with us again, please mention you are a return guest for an additional discount. Thank you for choosing Cabins USA and we look forward to having you as our guest again! Our family had a great time! The cabin was beautiful and we had a great view. Stayed at The Preserve with 11 other family members to celebrate my 50th birthday. Everything about our trip was beautiful, The location, the cabin, the amenities and of course the fellowship of family all made this the best birthday ever. I will recommend Cabins USA to all my family and friends. I know this will not be my last time visiting this beautiful place. Thanks Cabins USA for a memorable birthday. Thank you for all of your kind words! We here at Cabins USA work hard to make sure that each of our guests have the same wonderful stay you enjoyed while vacationing in the Smokies. When you are ready to stay with us again, please mention you are a return guest for an additional discount. Thank you again for your review and thank you for choosing Cabins USA! The whole booking process was a breeze! We love the location! & I cannot say enough about the cleanliness of the cabin! We thoroughly enjoyed our stay and look forward to staying again in the future! Cabins USA will be our go-to rental company from here on out! Thank you for all of your kind words! We here at Cabins USA work hard to make sure that each of our guests have the same great stay you enjoyed while vacationing in the Smokies. When you are ready to stay with us again, please mention you are a return guest for an additional discount. Thank you again for choosing Cabins USA and we look forward to seeing you again soon. We had a great time over Thanksgiving weekend. Lots of space for everyone and lots for the kids to do. The online checkin and express check-out was perfect. Not having to drop by an office and going straight to the property started out our vacation on a good note. Would definitely rent again. This cabin was amazing. My family loved it. We are planning another stay there already. I would love to see an outside fire pit with some chairs around it outside to the side of the cabin. I am so happy to hear that you enjoyed your stay in The Preserve. We here at Cabins USA work hard to make sure that each of our guests have the same great stay you enjoyed while vacationing in the Smokies. When you are ready to stay with us again, please let our reservationists know you are a return guest for an additional discount. Thank you again for your review and we look forward to having you as our guest again! The property was wonderful. We had 11 adults and 5 children and plenty of room to spread out. The kids loved the theatre room and pool (although the adults would have liked for the pool to be warmer). Our only complaint was it needs more scatter rugs to help absorb the sounds especially on the third floor. We are very likely to rent this cabins again! I am so happy to hear that everyone enjoyed their stay in The Preserve! We here at Cabins USA work hard to make sure that each of our guests have the same great experience you enjoyed while vacationing in the Smokies. Thank you for your suggestion. It has been forwarded on to our Owner Liaisons and they will be speaking with the owner of the cabin about possibly adding those rugs. Thank you again for your review and we look forward to having you as our guest again! It is really up on the mountain ... Have a good vehicle with a good transmission and brakes. There is no gas grill so bring your charcoal and starter. Beware of ants and small scorpions ... Maybe a seasonal thing? A young Bobcat hangs around the area but does not appear to be a threat. Not sure where the momma was! The tile around the pool is slick so warn the kids ahead of time. Otherwise, The Preserve is a great cabin that is very comfortable and a good value. Wonderful Home with beautiful views. The inside of the house is very spacious and the Bedrooms are very large. The house was in great condition and extremely clean. More than enough room for the 11 people that we had in our group. the location of the home is very center to the main strip with lots of sightseeing attrations and eating places. I look forward to coming back to this house in the near future. Thank you for all of your kind words and I am so happy to hear that everyone enjoyed their stay in The Preserve. Our housekeepers work hard to make sure that each of our cabins are thoroughly cleaned and fully stocked so all you have to do is walk into your cabin and start relaxing. When you are ready to stay with us again, please let our reservationists know you are a return guest for an additional discount. Thank you again for choosing Cabins USA and we look forward to seeing you again soon! We loved it!! Didnt want to leave! So much to do just there. We did have alot of trash n didnt know u were suppose to call n get them to pick up. The wifi never worked but other than those 2 we loved it. I am so happy to hear that you loved your stay at The Preserve! We work hard to make sure that each of our guests have the same wonderful experience you had while visiting the Smokies. Thank you for letting us know about the wifi not working. This issue has been forwarded on to our maintenance department so it can be corrected. Thank you again for your review and thank you for choosing Cabins USA! I dealt with Karen and Courtney at Pigeon Forge. They were very helpful and knowledgeable about the properties and suggested the Preserve which was exactly what was perfect for our weekend getaway. I would highly recommend this Cabin. Thank you so much for all of your kind words! Our reservationists appreciate being recognized for a job well done. When you are ready to make your next reservations, please let them know that you are a return guest for an additional discount. Thank you again for your review and we look forward to having you as our guest again! My family and I loved staying at The Preserve; however, the true stand out are the people who work at Cabins USA. We had an issue getting to the first cabin that we had booked. Because of the inconvenience, we were given The Preserve at a very good price. If nothing else, I would highly recommend Cabins USA because they truly take care of their guests. Thank you so much for all of your kind words! Our staff works hard to make sure that each of our guests have the most enjoyable stay possible while visiting the Smokies. Please feel free to contact one of our reservationists when you're ready to start planning your next trip to our area. They are always more than happy to help any of our guests find the perfect cabin. Thank you again for your review and we look forward to having you as our guest again!